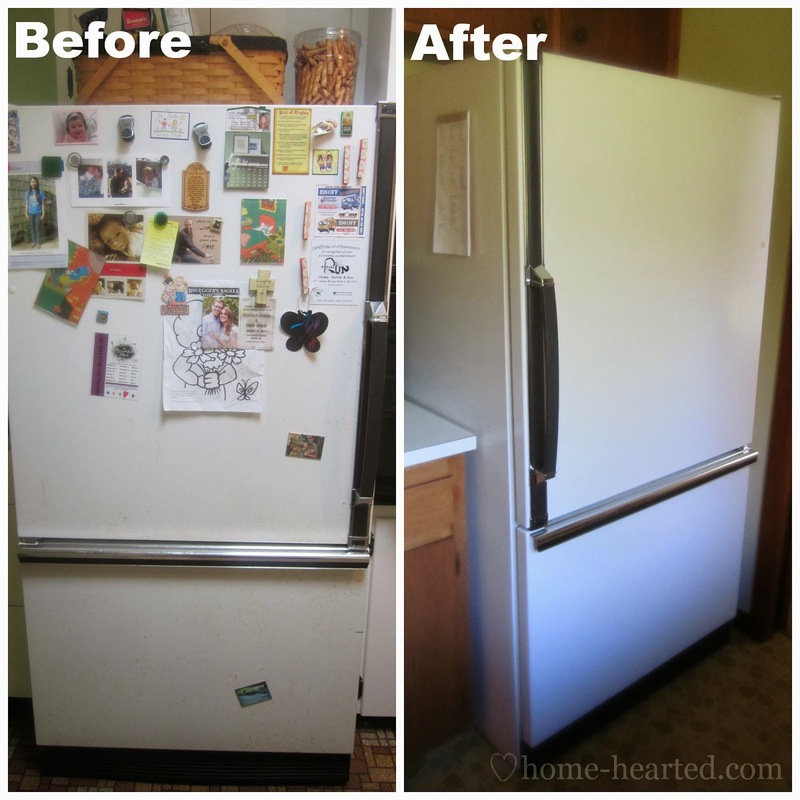 Have an outdated refrigerator, but it still works? Maybe just some ugly rust spots on it? Lucky you. 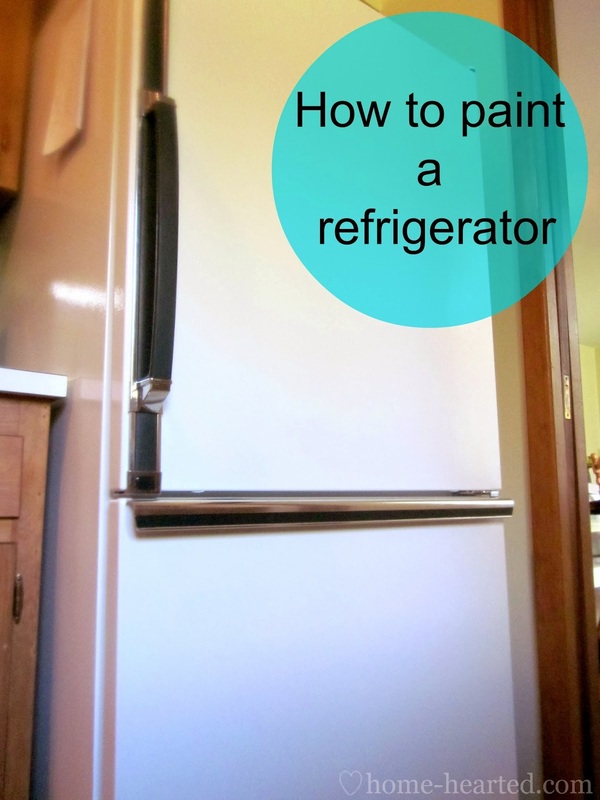 Today, you can learn how to paint a refrigerator. Hi! My name is Madalyn and I nest over at Home Hearted where I share my latest crafting, homemaking and diy projects. My husband and I just bought our first house and since it took most of our resources to get it I have been trying to do what I can to restore and utilize what we already have. First on my list was to take our rusty old refrigerator that we inherited from our rental house and make it into something a little more pretty. I had grand ideas, but my dad who is a painter talked me out of them and into restoring my fridge to its former glory, a simple white. And to compromise on the chalkboard he suggested I paint a large magnet in chalkboard paint and put it on the fridge. As you can see we also switched the door handle to function better in our new kitchen. The above picture doesn’t do the before any justice. It was so rusted and gross as you can clearly see in these pictures. It was in need of some major loving! So, I started out with lightly sanding the rusted areas and then applying two coats of Loctite Extend Rust Neutralizer, which you can see below what that did and how it looked. I then applied Rust-Oleum’s Protective Enamel in Gloss White. Because the rust was so bad on the front of the fridge and that is also where I applied the rust treatment I had to apply two coats of the paint. The rest of the fridge was fine with a light sanding and one coat of paint. I used a small 4″x1/2″ fabric roller for all of the painting. I think I used a small artists paint brush for one tiny area that I couldn’t get to with the roller. 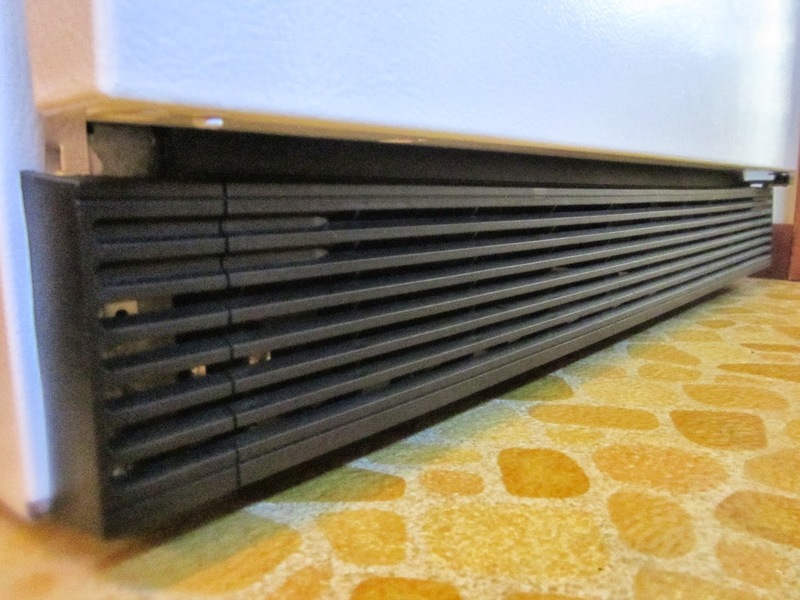 But, once we took the refrigerator apart it was very easy to get to all of the areas with the roller. I also spray painted the bottom vent a nice black. That really cleaned things up and adds to the “brand new” look. 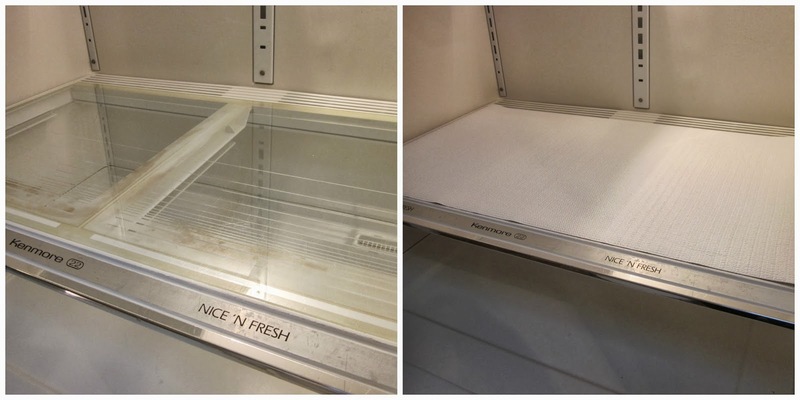 While I was at it I also took the time to clean up the inside of the refrigerator as the etched glass had received a stain at some point. I love the liner, it keeps things very simple as you can just pull it out and wash it, keeps things cleaner and easier! When all said and done I spent a total of $36.83 that includes the magnet, fabric rollers, paint and spray paint. 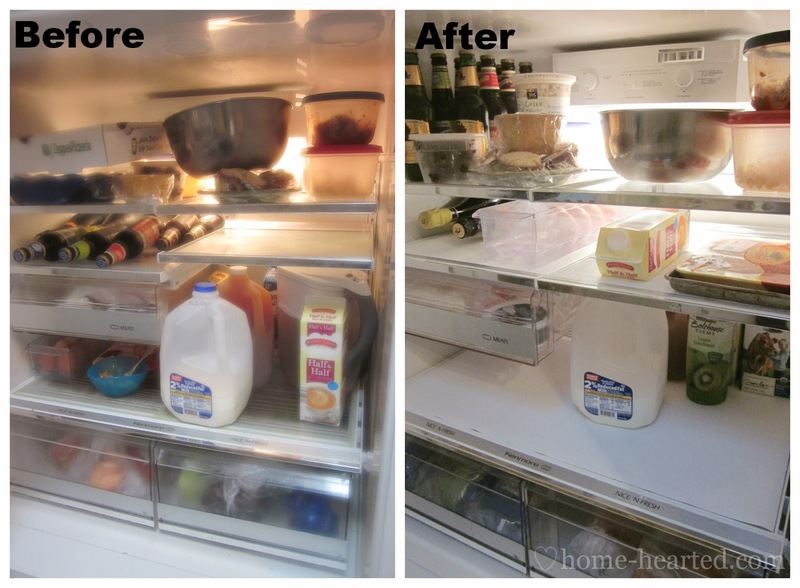 I hope you enjoyed this post and if you have any questions about how to paint a refrigerator, please leave a comment! Need more DIY kitchen project ideas? See how I made my laminate countertops look like stone here! Need DIY kitchen island ideas? See these! Want more countertop makeover ideas? There are nine here! And finally, get 10+ ideas for decorating, organizing and storage in your kitchen here! Quick question for you, I want to paint mine as well and I sure hope the color bisque is available. Would you be able to let me know what type, company, of paint you used for the 2 top coats, I understand the sanding and rust paint for those areas.. Thanks would very much appreciate it. Hi Madalyn (and Jenna!) — your work looks wonderful. Great job!!! However, I am completely perplexed about the moving of the handles and how you did it? No mention of filling existing holes on the right side of door or drilling new ones to accommodate the handle moved to the left. How was all of that accomplished? I’d so appreciate knowing. thank you! Most every fridge I’ve ever seen has the provisions to mount the hinge and handles on either side. All you have to do is unscrew it from one side and screw it into the other to swap. That said if you have one with a built in tv, computer, or something else in the door it might not have that feature. I haven’t messed with any of those and have no clue. You did such a great job. It looks so much better. Thank you for sharing this. Great job! But I cannot find a link to the chalkboard magnet. Help please! Hi Sandy! Madalyn from Home Hearted did this guest post. That post on the chalkboard magnet will be on her blog. Just head there and search for it! Hope that helps! 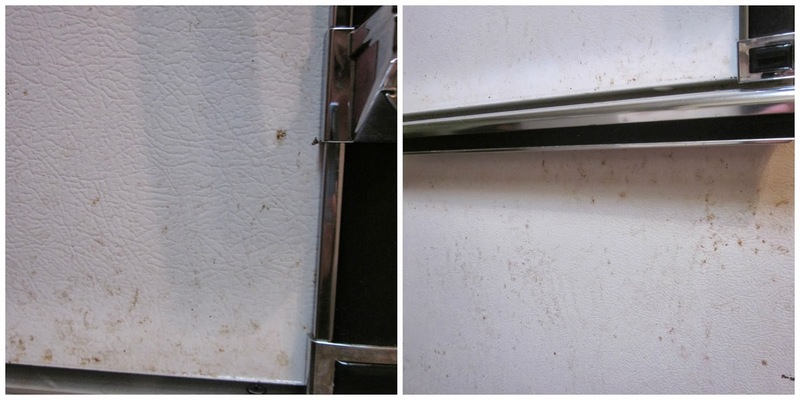 My old fridge has the same texture on the outside surface as yours – no real rust, but definitley worn areas. Any particular paint bonder / primer you could recommend for this surface? How about glue for new features? Hi Gabrielle! 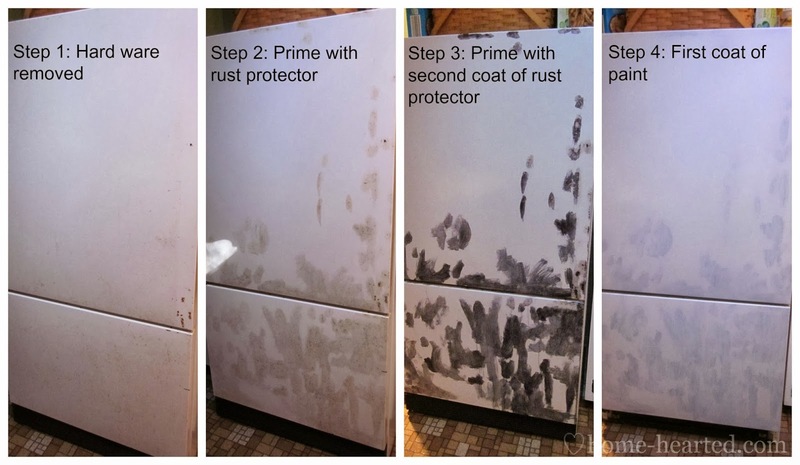 I think Rust-Oleum makes a refrigerator paint that goes right over the surface as long as its clean. You should be able to find it in any home improvement store. As for glue for new features, the e6000 glue will bond just about anything! My refrigerator is a plastic front. It’s black and really would like silver. Is there a certain paint I should use? Do I need to prime it? I’m not sure, Patti. I haven’t had much experience with plastic front refrigerators. I would talk to one of employees at my local home improvement store and ask them. I am getting ready to paint my refrigerator but have a question, what about the seals? Did u repaint? Can they be painted? Going from white to black. I don’t think that I would paint those, Carmen. I think the paint could easily chip off of there. This was very informative–gave me some confidence. I am buying a house with black appliances, however, there is no fridge. There are plenty of white ones on Craigslist for a song, but no black so I thought ‘why not paint it.” That’s when I found this post. Awesome pictures, great step-by-steps. Thank you very much for the info.